I’ll be attending SXSW Interactive this year and I hope to meet some fans of Bacon Ipsum. If you see someone that looks like Pvt. Pyle from Full Metal Jacket wearing a Bacon Ipsum shirt, it’s probably me. I promise I won’t eat your jelly donuts. 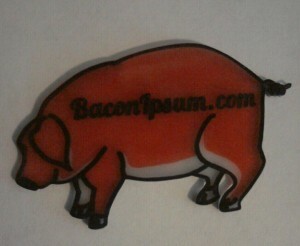 Or keep an eye out for my Bacon Ipsum badge. @jenkcunningham makes custom Twitter badges for people. You should get one. They’re awesome. This entry was posted in Blog and tagged sxsw. Bookmark the permalink.